And their secret to a healthy relationship is simpler than you'd think. When Thomas Howard was just a little boy, he and his family moved four doors away from the love of his life. According to Thomas, he knew when he first laid eyes on Irene that she was the one he wanted to spend the rest of his life with. ''I was only about 9 then and when I first saw Irene I thought, 'what a lovely girl, she's going to be my girl, this one' and my fondness for her grew since then," Thomas said. It wasn't long before Thomas and Irene became more than friends. As young teens, they would spend their time walking in parks together and sit in the back row of the movie theater holding hands. Even though Thomas was good friends with her brother, Frank, he says that Irene always came first. "I would regularly go 'round to Irene's house to call for Frank so we could go out to play but Irene's mother got fed up with me turning up day after day," he remembered. "In the end she joked, 'It's not our Frank you want, it's Irene,' and she was right." Because he was so smitten with Irene, Thomas put his friendships on the line for her on more than one occasion. "I nearly fell out with a friend over Irene but I liked the opposition. The other lad said that Irene was going to be his girl, but I said, 'no she isn't, she's my girl,'" said Thomas. "Even though we both loved the same girl, we were still good pals." By 1931, Thomas and Irene were spending every waking moment together. But in 1941, the two were forced apart for some time after 19-year-old Thomas was called to care for troops on the frontline in World War II. Thomas returned home safely, and the happy couple were reunited. They soon moved in together and wed in May of 1945. This year, the couple celebrated their 70th anniversary. 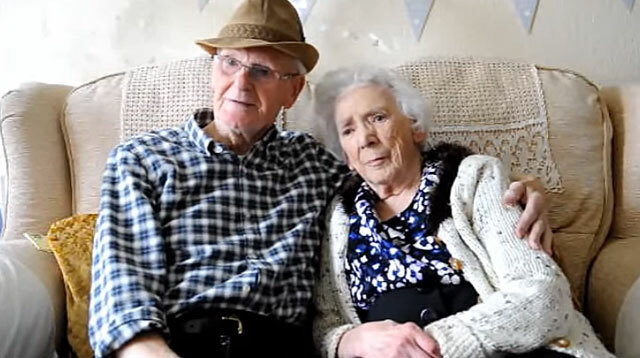 "Throughout our lives together, we have only shown each other respect and good manners, and I think a lot of youngsters could learn a lot from that," the 93-year-old shared. He says that, above anything else, these two things are what have kept them together through thick and thin. ''When I was a lad, I was always taught to respect women, and if you saw a female in the street or one of your teachers, you automatically tipped your hat to them, otherwise you would be in trouble," Thomas recalled. "I've always respected Irene—she's been my lifeline. I may have been wrong on certain issues and so has she, but we always make up by the end of the day." Aside from respect and good manners, Thomas says that his undying love for his 93-year-old wife is something about his relationship that he has and always will cherish. "We're still in love all these years on. I still have her now and I'm proud of her," Thomas added. "If I was fortunate enough to do it all again, I'd marry the same girl every time." This article originally appeared on Redbook.com. Minor edits have been made by the Cosmo.ph editors.